The Boston University Police Department sent an email to the student body Feb. 1 detailing five incidents reported to since Dec. 12, 2018 that involve students responding to fake online job opportunities. BUPD Lieutenant Daniel Healy said that students need to use critical thinking to identify frauds in order to avoid falling for them. Healy said the students who engaged in the fake job scams were sent a check in the mail and told to deposit the check, so that they could send that money back to the scammer in the form of gift cards. Giving a scammer gift card codes is essentially like giving them cash, Healy said, because the money is untraceable. BU is providing information about the scams to as many students as possible to combat them. BU spokesperson Colin Riley said multiple police agencies are investigating the scams. Riley said that although these scams may appear to be depositing real money into a student’s account, banks will later detect the fraudulent checks and the student will end up having lost money. June Woo Lim, a freshman in Sargent College of Health and Rehabilitation Sciences, wrote in an email that he was targeted by a scammer who had figured out his major. Mariah Brooks, a sophomore in the College of Communication, has also been targeted by scam emails. Brooks said she is happy that BU is taking the scams seriously and warning its students. 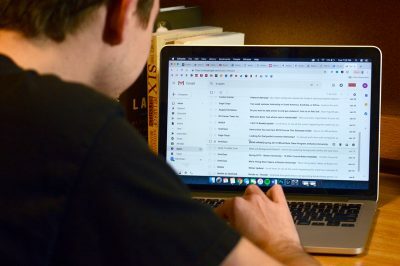 Amar Kaul, a senior in the College of Engineering, said that he believes students should be smart enough to realize if they are getting scammed or not.